Let’s say you’ve always wanted to have straighter teeth, and you’re wondering if it’s time to seek help from a dentist or orthodontist. So you search online and find a YouTube video called “Cheap easy braces!! Without going to the dentist!!!! !” Your instincts are screaming “NO,” but you can’t help wondering… could it really be worth trying? First of all, in case all of the exclamation points didn’t clue you in, the teenager who made this video doesn’t have any medical or dental training whatsoever. 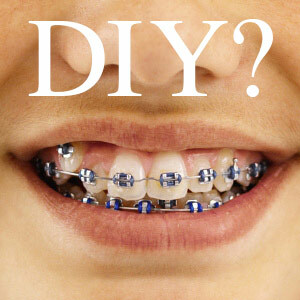 And just to make it clear right now, there’s no such thing as do-it-yourself braces — at least, none that are safe or effective. But the real problem with this video — along with many others in the same vein — is that if you try out what they suggest, you can seriously harm your teeth. So we’ll add our voices to the chorus: Braces aren’t something you can do yourself. Seriously. Trust us on this. Why not? Because it really does take quite a bit of training and experience to gain the necessary skill, knowledge and competence to move teeth safely. That’s why all practicing dentists successfully complete a four-year dental school program; orthodontists and other specialists have an additional three years of training on top of that. (And do you really think it would take seven years of training if it was easy? )Â We are familiar with the science behind moving teeth, and up to date on the best clinical practices. As medical professionals, that’s our job. There is one tiny grain of truth in those videos: we do sometimes use elastics to move teeth. The difference is, we’re using them in safe and effective ways. We know, for example, that if an elastic band is placed around teeth the wrong way, it can work its way into the gums and destroy the ligaments and bone that hold the teeth in place. This can cause teeth to loosen and fall out. So don’t be misled. If a promised treatment seems too good to be true, it probably is… even if it’s being touted on YouTube.